Who has not heard of the Greenleaf turntables and their famous inventor? Truly it is not always that "circumstances make the man" for Mr. Greenleaf is a shining example to the contrary; and there is no one who envies the success he has achieved because his indefatigable toil and hours of patient thought and study have brought about a just reward. He is a direct descendant of Samuel Greenleaf who made the first carriage in the United States, the factory having been started in Belleville, Mass., in 1792. Our subject was born September 26, 1838 and has been a resident of Indianapolis for the past forty-three years. He is a son of Edward and Mary Jane (Allen) Greenleaf, both of whom were natives of Bangor. Me., where they were reared and married. In 1850 Edward Greenleaf came to Indianapolis from Cincinnati, Ohio, where for many years he was superintendent of the famous Anthony Harkness, and Moore & Richards Locomotive works. After locating in Indianapolis Mr. Greenleaf became a partner with Watson, Vorhis & Co., in the Washington Foundry which afterward became the Eagle Machine Works. A few years later Mr. Greenleaf, in company with Capt. Vorhis. founded the City Foundry and Machine Works, in which R. R. Underhill was and W. W. Robinson subsequently became interested. On the death of W. W. Robinson the firm business was settled up and the City Foundry and Machine Works some years later became the Sinker, Davis Company, of this city. In 1864 Mr. Greenleaf founded the Greenleaf Machine Works which is now the Greenleaf Turntable Manufacturing Co. To Edward Greenleaf and wife were born eleven children, Frances Elizabeth (now Lancaster), Mary Jane (now Phipps), William A. and Clements A., yet living. The original of this notice. 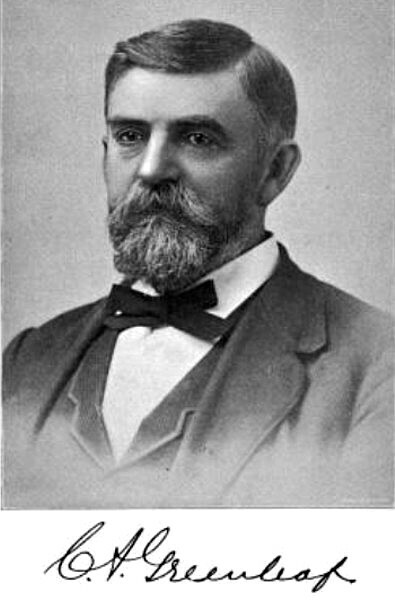 Clements A. Greenleaf. passed his youthful days in Cincinnati, Ohio, and there received his scholastic training. At an early age he evinced a strong liking and taste for mechanics, and in 1857 he became master mechanic of the Memphis & Little Rock Railroad. When the war broke out he was running an engine on the Memphis & Charleston Railroad but became north in May, 1861, and enlisted in the Eleventh Indiana Volunteer Infantry, under Gen. Lew Wallace, serving over three years in the ordnance department of the Gulf. During that time he had charge of the ordnance of the Thirenth Army Corps and the stores for one year. On the sixth of August, 1862, he was married in Indianapolis, to Miss Frances Caroline Phipps, daughter of John B. and Rebecca (Snell) Phipps, natives of Virginia and Massachusetts respectively. Mr. Greenleaf and wife became the parents of teu children: Edward Timothy, born August 27, 1865, married Miss Jennie Boor of Sandusky, Ohio, and is now residing in Lima, Ohio, where he is superintendent of the drafting rooms and supply department of the Lima Locomotive & Machine Works; Clements A., born August 19, 1867, married Miss Elizabeth Bertie Wilfley, of Mexico, Mo., and now resides in this city; the next two children were twins, John L. and Harry, born July 30, 1869 (the former is single and resides in this city but the latter died at birth); Mary, born January 14, 1872, is single and at home; Helen M., born April 12, 1874, is single and at home; Frances Jane, born December 5, 1877, died when four years of age; the next two children were twins, Grace and May, born May 16, 1881, now at home; and Paul, born March 25, 1884, is also at home. Our subject is a mechanical engineer and for the past twenty years has been engaged in manufacturing the famous Greenleaf Turntables in this city. His invention is used by railroads in turning their cars and engines, they are in use on most of the railroads in the United States, Canada, and Mexico, and the large factory in Indianapolis is now engaged in manufacturing turntables alone. There is no part of his life work to which Mr. Greenleaf refers with more pride than to the mission work he has done in this city. He is a strong church man and believes that every individual should interest himself in this work. He delights in assisting and relieving the poor and oppressed and no one has done more for that class of people than he. For years he has carried on this good work and is today as active in its support as in former years. In 1872, Mr. Greenleaf organized a company to consist of 150 stock holders, each holding an equal amount of stock for the purpose of establishing a co operative industry. About one-half of the stock was subscribed, the works were built, a farm was purchased, each stock holder was deeded one acre of land, and by-laws made so that no stock holder could accumulate more than an equal share of the property, (any stock holder wishing to withdraw could do so by selling to the corporation and the stock to be cancelled). The enterprise failed, principally because so many could not be of one mind, and because of the panic of 1873, Mr. Greenleaf was forced to go into bankruptcy. The works that he built are now the principal building of the Cleveland, Cincinnati, Chicago & St. Louis Shops, and the farm he bought is now the suburban town of Brightwood. Mr. Greenleaf was the first one to inaugurate the sale of town lots in Indianapolis, on terms at which the poorest laborers could become owners of their own homes. He selected a small subdivision in Oak Hill with which to try the experiment, found about thirty families that were distressed, and induced them to purchase lots at $125 each, by paying $10 cash, and the balance $5 per mouth, giving possession on the receipt of $10. Many of these houses, at first, would have been called shanties, but they have been gradually improved until now most of them are neat cottages, and best of all is, that the real estate owners who refused at first to sell without a cash payment large enough to pay expenses of foreclosure are most all now ready to sell on terms as described; there is no necessity of making a deed until the full payment of ground has been received. The secret of the success is that the rent applies as purchase money. Mr. Greenleaf has built three factories, first one the "Greenleaf Machine Works." corner Tennessee and Merril Streets; second, "Greenleaf Manufacturing Company," at Brightwood; third one, the present "Greenleaf Turntable Manufacturing Company," corner Bloyd and Parker Avenues, also fourteen cottages in Brightwood, and eight in the city limits. Oak Hill. He has assisted in building three Presbyterian churches. "Second," corner of Pennsylvania and Vermont Streets; Ninth, corner "North'' and Penn Avenues; aud '"Memorial," corner of Christian Avenue and Ash Street. To the last named he gave more time and cash than any other one, paying cash, $5,600 into the building fund. Mr. Greenleaf does not believe in sects, but does believe that the Christian religion, is to believe and hold to the person of the Lord Jesus Christ, and that the real Church, is his body, purchased with his own Blood, and that it should have one mind with all members holding to Jesus as Head, with the Holy Spirit the Guide, and the Bible the rule of our lives here.